mahodorowicz #DiabetesChat And EVERY savory dish tastes better with onions and garlic!!! mahodorowicz #DiabetesChat BUT: every food can “FIT”…as long as it fits your carb budget at meal and eatne in moderation! mahodorowicz #DiabetesChat Eating sweets occasionally is OK! Not realistic to deprive yourself of life’s goodies! mahodorowicz #DiabetesChat Bakery is God’s gift to mankind!! mahodorowicz #DiabetesChat Use whole grain flour to make your own baked goods: adds LOTS of fiber and great texture! mahodorowicz #DiabetesChat Can use applesauce in place of fat in many of your bakery recipes. Yummers! Really works! mahodorowicz #DiabetesChat Use fat free non-dairy whipped topping mixed with sugar-free pudding powder instead of frosting on a cake. GREAT! mahodorowicz #DiabetesChat Add healthy nuts to your cold cereal formore crunch, protein and heart healthy fat. mahodorowicz #DiabetesChat Did you know that red wine is heart healthy??? mahodorowicz #DiabetesChat Red wine as reservatrol that is heart healthy. mahodorowicz #DiabetesChat I love FIBER ONE bars. Especially chocolate ones! mahodorowicz #DiabetesChat Crush up FIBER ONE bars and mix into fat free non-dairy whipped topping and put on fresh berries or angel food cake. YUM!! mahodorowicz #DiabetesChat Low carb option: baby carrots with spinach dip. mahodorowicz #DiabetesChat Costco has great wine selection, esp. red. Good for you in moderation. mahodorowicz #DiabetesChat Crack a fresh egg into half an avocado and bake in oven…top with grated low fat cheese! mahodorowicz #DiabetesChat It;s now apple season. Baked apples with sugar sub, almond extract and cinnamon is great as dessert, snack. High fiber. mahodorowicz #DiabetesChat I get my cat food at Costco. Anybody else? mahodorowicz #DiabetesChat Don’t forget toothpaste and dental floss for good oral health. Important for people with diabetes. mahodorowicz #DiabetesChat Gum disease can lead to a heart infection! Yikes! Floss those teeth every night!! 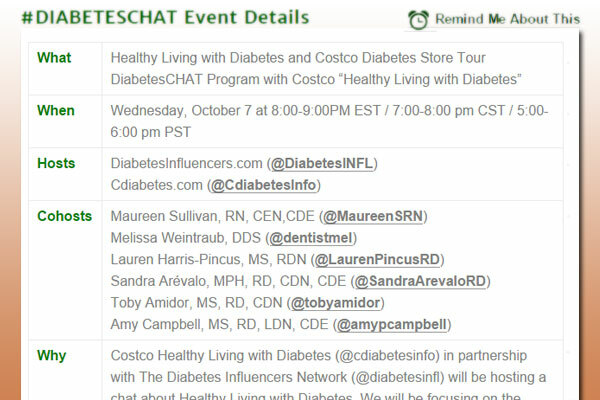 mahodorowicz #DiabetesChat Buy the electric toothbrushes at Costco for MUCH improved teeth cleaning. Stock up on extra toothbrush heads as wear out. mahodorowicz #DiabetesChat Don’t forget body lotion for dry skin..can be issue for some people with diabetes. Lotion up! mahodorowicz #DiabetesChat Don’t forget your slippers for around the house. Don’t go barefoot if you have diabetes! Costco has great selection! mahodorowicz #DiabetesChat Low fat granola cereal is good topping for low fat ice cream or pudding. mahodorowicz #DiabetesChat Seltzer water is carb and calorie free and has lots of great fizz. Mix with a little juice to flavor it. mahodorowicz #DiabetesChat White foods are NOT bad foods!! Can fit into carb budget for meal! Any food can fit for people with diabetes!! cdentist1 #DiabetesChat I love the dentists tweets! mahodorowicz #DiabetesChat If doctor says to take baby aspirin, can buy at Costco. mahodorowicz #DiabetesChat Alcohol free mouthwash is a MUST for good oral health…get at Costco. mahodorowicz #DiabetesChat Green tea is high in antioxidants which are a must for people with diabetes. They reduce oxidation which causes call damage. mahodorowicz #DiabetesChat Apple everything now. Tis the season. Great fiber, crunch, sweetness! Bake away! mahodorowicz #DiabetesChat Don’t forget to pumpkin up in Oct. and Nov. Pumpkin puree and filling can be variety of ways. VERY healthy + antioxidants! mahodorowicz #DiabetesChat Vitamin-mineral water is good for electrolytes. Has natural flavors and no sugar. mahodorowicz #DiabetesChat Make wine sprtizer with vitamin-mineral water or seltzer water. Moderation is key with liquor. cleverlychangin Let me know about the next #diabeteschat. My daughter is newly diagnosed and I’m trying to help her live normally and make good choices. mahodorowicz #DiabetesChat Don’t be afraid of diabetes! It is controllable! So many healthy choices at Costco! mahodorowicz #DiabetesChat Vitamin-mineral deficiency increases cardio-metabolic risk! Eat lots of fruits and veggies to get those nutrients!